Before we start... A happy new year to all our visitors! 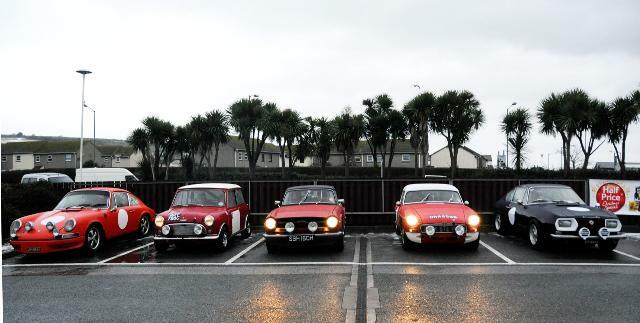 Some of HERO's impressive fleet, from left to right, a Porsche 911, a Mini Cooper, a Triumph TR6, a MGB, and a... You know, I'm not really sure what that is... any ideas? Visitors to Race Retro are to be given the chance to drive a rally car, thanks to HERO, The Historic Endurance Rallying organisation. For just £20, visitors to the event, which takes place at Stoneleigh Park, Warwickshire, from Friday 24th to Sunday 26th February, will be given the chance ‘arrive and drive’ one of HERO’s rally prepared cars, put it through its paces and get a feel for rally driving on a purpose built course adjacent to the Live Rally Stage. Hero’s ‘arrive and drive’ fleet consists of classic vehicles that have undergone extensive restoration and are maintained daily by a team of in house mechanics. Each car is prepared to meet the requirements of endurance rallying as they can be hired for use at events all over the world. Visitors can either book on the day or contact enquiries@heroevents.eu to reserve a time slot that fits in with the rest of their time at the show. In the halls, Hero will not only have the extremely rare low-drag lightweight 1964 Jaguar E-Type Lindner Nocker on display, but will also reveal the Hero Village featuring key partners such as CES and Autosessive, Classic Motor Cars Limited, Bob Watson Engineering, bodywork specialist C&N Customs and Puzzle Ltd. These companies will be offering exclusive show offers throughout the weekend. There will be the usual selection of competition cars and clubs – the backbone of the sport – making Race Retro the place to be for anything to do with classic motor sport. Looking to invest in a piece of racing history? Visit Silverstone Auctions where you will find cars, bikes and memorabilia on offer. As well as an array or cars and motorcycles, scour the autojumble for that elusive part or spare or visit the hundreds of traders offering everything from helmets and racewear to stunning artwork, rare books and signed motorsport memorabilia. Adult ticket prices are £20 when booking in advance, £25 on the gate. Children’s tickets are £5 on Friday or Saturday and free on Sunday. Parking is also free throughout and for 2012, the parking areas have been moved to hard surface areas within close proximity to the halls. The show is open from 9.30am each day and closes at 5.30pm on Friday and Saturday and 4.30pm on Sunday. To book tickets and for the latest updates, visit www.raceretro.com.